This week we were having a session in which we had to estimate the effort required for a new ADF project. The application we have to develop will support a large chain of shows specializing in interior decorating. One of the functions in the application is to create the plan for decorating the homes of customers. In this plan, for every room in the house the salesman has to create a list of actions – paneling the floor, laying the carpet, doing the wallpaper and the curtains – and for each action the customer and salesman have to select the materials: which wallpaper, which carpet and which curtain fabric. Choosing the materials is a somewhat intricate process, that includes selecting the manufacturer, the color, the quality, the size and type etc. These choices are mutually dependent: after selecting a manufacturer, the list of colors and types is limited. However, the customer can also start by selecting a color, and that should limit the list of manufacturers to choose from. And choosing a price range or quality level will limit both lists of manufacturers and colors. Etcetera. The question we had to answer is whether this functionality of mutually dependent lists of values in a List of Values selection window is a complex one, requiring up to several days of programming effort, or a simple one that would take in the order of a couple of hours. This morning – it being a Saturday and all – I decided to give it a try. And, as the project manager will gladly and smilingly learn, it turns out to be incredily simple. Even a couple of hours is overstating the effort. Good news for us and for our customer! From the EmpId field I can bring a popup List of Values window where I can select an employee to add to the project. 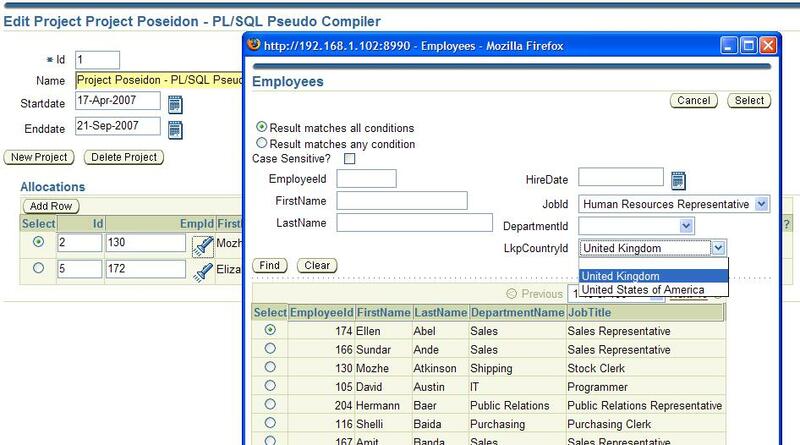 This window allows me to search the employees using several criteria, including Job, Department and Country. These search criteria are not independent: when I have selected a Job, the list of department can be shrunk as only a limited number of departments will contain employees in any given job. At the same time, when I select a country, the list of departments can be filtered, as only some departments will be located in the selected country. 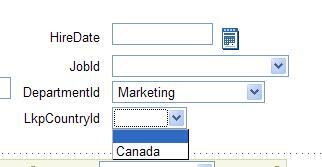 And when I select a Department, the list of Countries as well as the list of Jobs can be adjusted. In general: multiple search items have mutual influences. The question now becomes: how can I quickly implement the functionality to automatically refresh Countries and Departments when Job is changed, Departments and Jobs when Country is changed and Countries and Jobs when Department is changed? 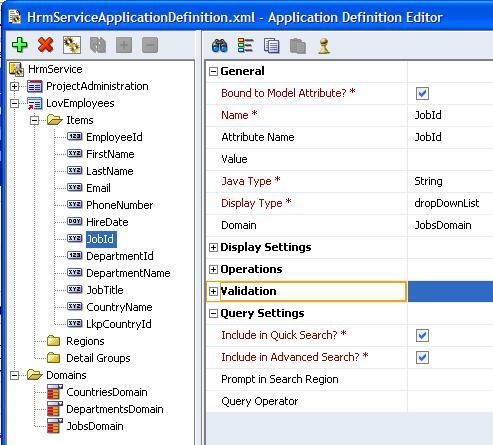 The starting point is an Application Module with Entities based on the table in the standard HR schema complemented with a PROJECTS and a PROJECT_ALLOCATIONS table. I created the default ViewObjects for these entities. Then add a usage for the ViewObject to the Application Module’s DataModel. I create similar ViewObjects for Countries and Jobs, and add usages for those to the AppMod’s DataModel as well. The EmployeesView is composed from the Employee Employee Entity joined to several lookups: JOBS, DEPARTMENTS, LOCATIONS and COUNTRIES. 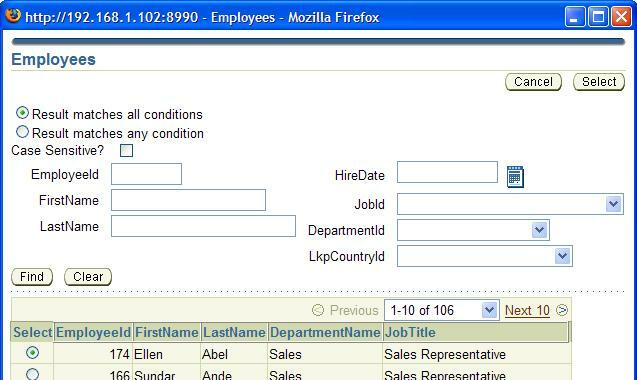 This will make it possible to search for employees on criteria like Job Title, Department Name and Country Name. The application is to be generated using JHeadstart, giving a regular, manually maintainable ADF Application with great productivity. After Enabling JHeadstart on this project and creating a new JHeadstart Application Definition file, I quickly create a Master and a Detail Group for Projects and Project Allocations. Next I create a Group LovEmployees for selecting Employees in a List of Values Window. I will link this LOV to the EmpId item in the Project Allocations Group. Finally I create three Dynamic Domains, based on the three ViewObjects for Countries, Jobs and Departments. This takes me some 10 to maybe 15 minutes. Now things will get a little more interesting. I have indicated which items in the LovEmployees Group should appear in the table layout – the list of employees to select from – and which are search items that must be part of the Advanced Search region. 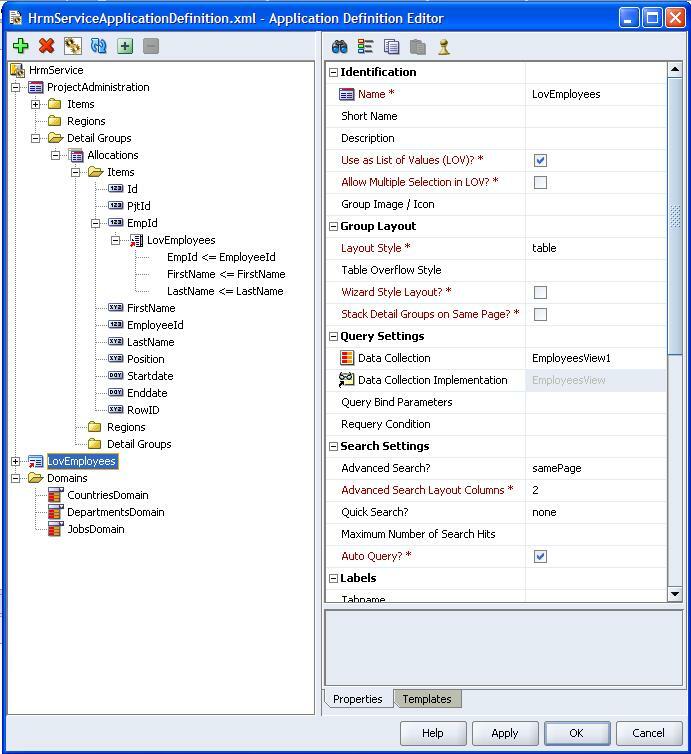 For example: JobTitle is displayed in the table layout – but is not one of the Advanced Search items – while the associated JobId is not shown in the table but is an Advanced Search Item. The same relationship exists between CountryName and LkpCountryId and between DepartmentId and DepartmentName. The LkpCountryId, JobId and DepartmentId should be displayed in the Advanced Search form as dropdownlists. We set the appropriate display type for these items and select the domain to derive the values from. There is only one thing left for us to do: providing the values for the bind-parameters, such as the Job and Country Id values for the list of Departments or the Job and Department Id values for the countries. 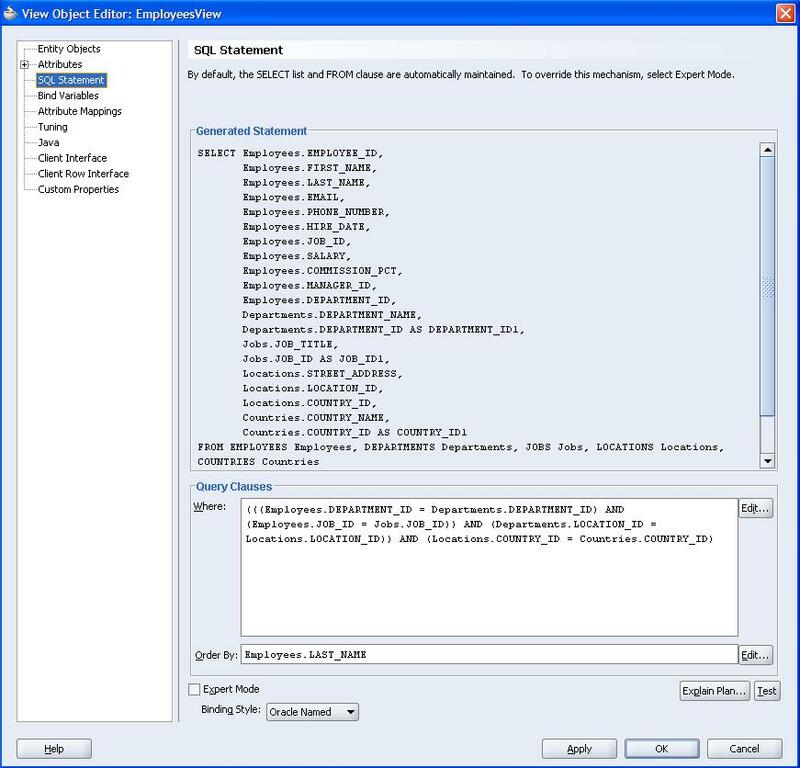 <af:selectOneChoice id="SearchLovEmployeesDepartmentId" label="DepartmentId"  autoSubmit="true" immediate="true"
Concluding: without any programming – except for the SQL Queries in the ViewObjects – and just a little bit of declarative specification, ADF and JHeadstart make it quite straightforward to implement a series of mutually dependent selection lists. Download tje JDeveloper 10.1.3.2 Application: LovWithAjaxRefreshInSearch.zip. Hi I am tryign to implemet the same feature.But instead of search area I have it in Table layout. I have created 2 view objects view1 and view2. I created dynamic domain based on these 2 which help for the dropdown lists. I guess this is the standard procedure for cacasing lists. Build 10.1.3.1.30 is what it says in the About Window and the JHeadstart Application Generator log. Which version of JHS are you using ? I have some troubles with the latest evaluation version.